Are you into mixing sounds to produce a new track? Looking for a program to help you do the job? If you do, then you will find answers here! We understand that DJing is a great career. Meanwhile, others simply enjoy doing it. If you are into this craft and you want to take your passion into the next level, it’s time to invest in a quality DJ software. Check out our list below. The people behind this software designed this with utmost reliability because they know that this factor is crucial whether you are at home or headlining. They also boast of having the lowest latency in the market. DJ Pro is the most popular DJ software globally. Whether you’re talking about Hip-Hop, Dance and anything in between, this is the tool for you. This is equipped with rock-solid reliability and trusted by DJs for its incredible performance. In fact, this powers the world’s top artists on some of the biggest stages. This tool supports over 90 pieces of hardware by industry leaders and every piece is tightly integrated to ensure the best experience possible. Furthermore, it offers you freedom for limitless performance. Its innovative features and intuitive interface will unlock the creativity in you. Link – Ableton Link for syncing Serato DJ Pro with other devices usually over a local network. Record – Record your mixes to upload online or listen back later. FX – Up to 46 different effects that range from simple to complex so you can mess with your music. Sampler – Load up to eight samples into the Sampler to play during your set. Cue Points – Set eight Cue Points per track which can be triggered by your hardware and are visible on the waveforms. Beatjump – Instantly jump forward or backward in your track by a predetermined amount, perfectly in time. Colored Waveforms – Colors in the waveform show the frequency of the sound: bass is red, mids are green, treble is blue. Sync – Sync will match the BPM of your tracks to free up your time, opening up a new range of possibilities. Key Analysis – Analyze the key of your tracks. This can be displayed in a number of different formats. Loops – Set and use Auto Loops, Saved Loops and Manual Loops. Prepare Crate – Add tracks to a holding area to prepare your set. Once played, the track is removed from the area. Library – All your music in one place. You can use iTunes, Crates and other features to organize your sets. Four Cue Points. Same as above. BPM Controls. Use sync and onscreen Pitch Slider to control the BPM of your tracks to get seamless mixes with no hardware connected. Onscreen Crossfader. Play two songs in Practice Mode – without hardware connections. Are you looking for a DJ software free? 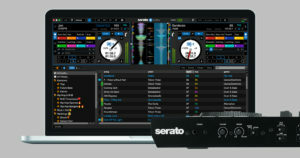 Then Serato DJ Lite is the one for you. This is a stripped back version of Serato DJ Pro. Lite is easy to learn and it keeps things simple especially for beginners. This is built on Serato DJ Pro technology, so you can trust on this to be reliable and intuitive at the same time. Among the best thing in this tool is that it has a Practice Mode that doesn’t require any hardware which gives starters the opportunity to start and experience what DJing is. With it’s easy to use hardware, you will never have a hard time learning how to use this app. If in case you find you find this too challenging for you, don’t worry because they have customers and technical support teams that are ready to assist you if you need help. In addition, they have a comprehensive range of tutorials that you can easily follow to make things work. Cue Points. Set four Cue Points per track which can be triggered by your hardware and are visible on the waveforms. Onscreen Crossfader. Play two songs in Practice Mode. No need for hardware connection. Set and use Auto Loops, Saved Loops and Manual Loops. All your music in one place. You can use iTunes and Serato Crate to organize your sets. Cue Points. Same as above. Sampler/Fx. Add something extra to your set and mess with your music using cool effects. Colors in the waveforms how the frequency of the sound: bass is red, mids are green, treble is blue. Match up the BPMs of your playing tracks for the easy transition. Song Analysis. Find key and track information such as BPM and track length. 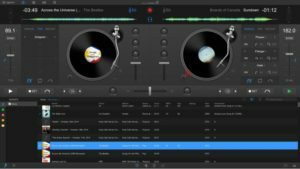 Virtual DJ is another great DJ software for PC and MAC. A number of DJs have already replaced their turntables and CD players to use this digital music instead of vinyl and CDs. Sandbox. Help you get ready for your next mix at the same time your audience is enjoying your current song. With this feature, you can move to the end of the playing track and mix in the next track. Sampler. This lets you play unlimited samples at the same time. The selected samples can be audio tracks, videos or images. You can organize and group samples like an instrument bank. Sound Engine. The audio components include an equalizer, filter, limiter or pitch-stretcher are designed to leverage the strength of modern computers to deliver crystal-clear sounds. Browser. This has three components – folders, file view and side view that lets you manage your folder, karaoke list, side list for easy access. Effects. The effect windows can float and be moved around the computer screen. You can un-pin the effects list to place it where you want. Automix. Let’s you pre-edit an auto mix sequence, fine-tune mix out and mix-in marks, the transition type and with videos. The program remembers mix tuning and lets you use those settings when you use the same two songs next. Track Cleaner. Make edits to your tracks by removing inappropriate lyrics, deleting unnecessary intros or looping sections. Video. Add text effects or lyrics or add new video tracks to audio-only tracks. Sample. Adjust how you use audio, video or image samples including tweaking transparency on videos or cropping audio clips. Point of Interest. Manage your cues, including beat grid anchors, saved loops and auto mix points. Broadcast. Share your mixes to popular social platforms and add a cool graphic with video skins. You can also engage with your viewers with screen-grab and visualization. 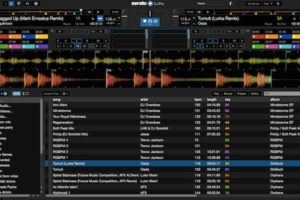 Traktor Pro 2 is a professional 4-deck DJ software. It contains a wealth of software features designed for ultimate flexibility and intuitive pro performance. It has an advanced library management to automatic track analysis to take care of the essentials. Traktor offers video tutorials to help you learn the basics. It includes step-by-step videos co-produced with top industry partners that cover everything from set up to manage your music files. It contains tips on how to refine your mixes and more, too! Track Preparation. Browse and find your favorite tracks in seconds. This also comes with full iTunes integration that is quickly accessible directly from Traktor. Sync. Track BPM, beat grids and key are automatically detected on import used by the powerful Sync engine for perfectly beat matched mixes – every time. Software Mixer. The built-in software mixer that provides a wealth of customizable professional DJ mixer features. Choose from different EQs and filter types modeled after industry favorites. Looping and cueing. Record audio from a live source, master out or individual channels for creative, multi-layered overdubs. Then transfer sounds into Remix Decks slots instantly. Remix Decks. Slice, edit and deconstruct tracks on the fly using Traktor’s Remix Decks. You can spontaneously capture loops and load sounds in up to 64 slots during your set to add a personal touch to your tracks. Stems. A Stem file is an open, multi-channel audio file that contains a track split into four musical elements – bass, drums, vocals, and melody. You can load the file into Traktor Pro’s Stem Decks and create spontaneous edits, acappellas, instrumentals and more with each track element available independently. Each stem is visible as its own waveform thanks to the Stem View. UltraMixer provides a lot of new entertainment possibilities to play music videos and karaoke songs just as easily as normal audio songs. It has crystal clear sound, real database, 70 native supported MIDI controllers for music, karaoke or video mixing. This is the perfect DJ software for any mobile DJ. UltraMixer combines many apps in one software. When you buy this, you will have the following tools too. 4-Deck Mode. Allows you to mix or prepare up to 4 tracks. Integrated auto-sync. Allows you to mix tracks mit in one simple click. Supports MIDI controllers. UltraMixer can be controlled by mouse and keyboard or all common MIDI-DJ controllers. It has over 80 DJ controller mappings that are directly included in UltraMixer – plug in and play. New MIDI controller is constantly added and provided via free software updates. The integrated MIDI mapper makes it possible to create your own MIDI mappings and change predefined mappings. Supports common brands including Pioneer, Denon, Reloop, Numark, American DJ, Hercules, Behringer, M-Audio or Vestax. Stable audio engine with auto-sync functionality. This software offers you crystal clear and precise sound and professional mixing with a single click. The stability is guaranteed even if the system is under high load. Auto-DJ. Automatic transitions with equalized volume and automatic music for hours. It allows you to enjoy hours of music with perfect transitions. This is perfect for the time right before the manual mixing, automated background music in restaurants or a replacement for a real DJ at parties. Create your own blends. There are different blending curves to choose from and you can create your own blends for a perfect mix. UltraMixer also supports your mix with its built-in loudness normalization for equalized volume. Modern and powerful interface. It has a clean and modern interface that is adjustable by widgets. You can even adjust the font size, font family via mouse click. It has different skins and color schemes too for variety and individuality. Database-backed music archive. It is equipped with a true database for professional music management that allows you to integrate and do a quick search for suitable music in just a matter of seconds. Create virtual groups, playlists, and wishlists. You can mark them by assigning colors and sort them to fit your preference. Import iTunes or BPM-studio archives into UltraMixer with a single mouse click. 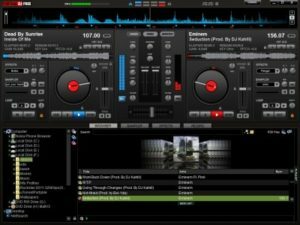 Deckadance is another software that allows you to DJ like a pro. 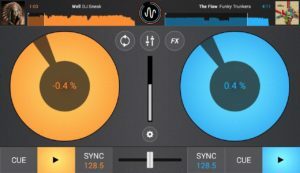 This DJ mixing application tool is so powerful, you will surely love it. Deckadance 2 encourages you to unleash your freedom and creativity in creating music whether you’re a touring professional, remix/groove producer, turntablist, scratch DC, club DJ or mobile DJ. This DJ software allows for flexible configuration depending on your performance objectives. With this, you can run VST compliant effects and softsynths for producing unique mind-blowing musical performances. It can also be controlled with MIDI controllers, timecoded vinyl and CD systems. This is equipped with all the necessary tools and features you need to do get the job done. 2 or 4 Decks capable of loading MP3, FLAC, M4a (iTunes), WMA, WAV, AIFF, and OGG. Automatic and manual beat detection and beat-gridding of tracks for sophisticated beat-matching. Time stretching/compression – zPlaneElastique time-stretching/compression technology (key lock) for best master tempo quality. 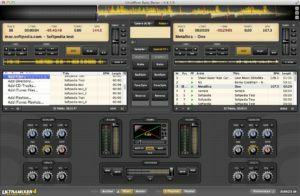 AlgoriddimDJay Pro 2 reinvents the DJ software. It is the next generation of Algoriddim’s multiple award-winning DJ software. It has a unique, modern interface is built around a sophisticated integration with iTunes and Spotify, giving you instant access to millions of songs. 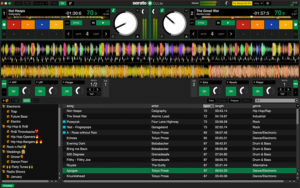 DJay Pro 2 reinvents the DJ software. It is the next generation foAlgoriddim’s multiple award-winning DJ software. It has a unique, modern interface is built around a sophisticated integration with iTunes and Spotify, giving you instant access to millions of songs. It has pristine sound quality with the powerful set of features including high-definition waveforms, four decks, audio effects, video mixing and hardware integration for creative flexibility to take your sets to new heights. My Library. Has a rich and powerful library editing features for easier music management. You can create your own custom playlist using songs from iTunes, Spotify and the file system. Split Mode. With this, you can view songs from iTunes, Spotify and Finder side by side. This makes managing songs from multiple sources more convenient and efficient. Smart Filters and Playlists. Helps you organize your playlists quickly. It includes 12 different criteria, you can also create rules to display what you need, to create permanent playlists or to temporarily find a specific song. Single Deck Mode. Gives you a large view that is ideal for preparing cue points, loops and beat grids. djay + Spotify. This is the first DJ software that integrates Spotify and gives you access to millions of songs. Automix AI. Automatic DJ mixes based on artificial intelligence. With this, you can lean back and automate your sets in advance with stunning transitions. It also uses machine learning and training sets from human DJs, Automix AI intelligently identifies rhythmic patterns and the best intro and outro sections of songs. This also calculates optimal fade durations and automatically applies parameter changes to EQs and filters for a seamless transition. PhotoBeat. Mix photos in perfect sync with the music. Saved loops and cue points. Allows you to save up to 8 loops and cue points. Post-fader FX. The effects can now be assigned post fader so that closing a fader no longer means shutting off effect tails. New Audio Engine. Offers ultra-low latency, better speed, high-resolution waveforms, and better effects, EQs, filters, and loops. Keyboard shortcut editor. Includes a full keyboard editor that is very useful if you work with a laptop and want to add frequently used features to your setup via the keyboard. Improved visual transitions. Mix vides with visual transitions including Blend, Luma, Cube, Swap, Grid, Mosaic and Push. Title and image overlays. Allows you to overlay videos with text titles and images. A/V recording. Aside from video mixing capabilities, this gives you the ability to record your sets including audio, video, overlays, and effects. Visual FX. Includes a host of high-quality visual effects which can be chained to offer a large amount of audio and video creativity. The effects include Grid EQ, Kaleidoscope, Circle Splash, RGB Offset, Edges, Invert, Tiles, Splash, Ripples and Radial Blur. Visualizers. You can apply stunning audio visualizers to your songs and synchronize it to the music based on tempo, beats or frequency. External display. DJ pro has the ability to display output to monitors, TVs, and projects with the right connectors. Pre-Cuing. Preview and prepare your next song through headphones. Multi-channel audio interfaces. Offers native support for USB audio interfaces. MIDI Control. Supports over 50 MIDI controllers and includes an advanced MIDI Learn system. Plug & Play Setup. Allows you to set up your preferred DJ system. CDJ integration. You can link up to 4 CDJs. Allows you to easily integrate the DJ software with up to 4 CDJs. 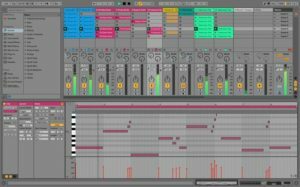 Ableton Live 10 available in three editions – Intro, Standard, and Suite. This DJ software allows you to create rich sound with a new synthesizer. You can add stomp box crunch and give it space and character. You can also shape the sound of your drums, and automate with precision and ease. Live is smart, it will remember your ideas even if you didn’t press Record. You can also edit multiple MIDI clips at the same time and edit audio directly in the arrangement. That’s not all, you can expand your Djing experience with its built-in Max for the Live feature. However, this is only available for the Suite edition. Here’s an overview of the three Live variations. Unique Session View for quick, intuitive composition and flexible performance. Group tracks. Use multiple levels of groups to mix with great flexibility and manage detailed arrangements more easily. Ableton Link keeps instances of Live and a growing collection of iOS apps in time over a wireless network. Modern technology and streamlined applications have taken the disc jockey industry to the next level. With this DJ software app, you will get to enjoy a plethora of cool features when using Cross DJ Pro. 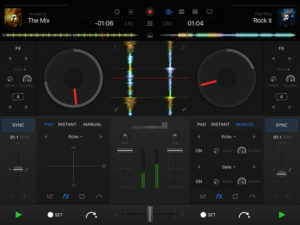 Cross DJ Pro is one of the most popular DJ applications available in the smartphone market. This could be due to the various editing options it offers. Here are some of the features that you will enjoy from this app. 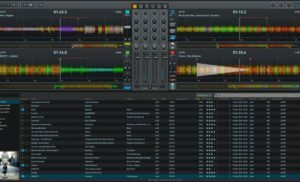 This is a free and open source DJ software for Windows, macOS, and Linux. Due to its nature, you can expect tons of contribution from the community that yields to a number of impressive features. 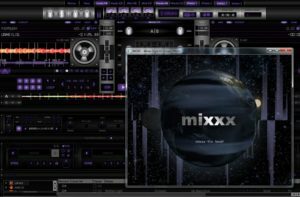 Mixxx is probably the best free DJ software you will ever find. It is rich with powerful features and most especially, a friendly community of DJs, programmers, and artists who are willing to contribute to making this software better. BPM, Key Detection and Sync. This helps you find the perfect next track from your library. You can use master sync to match the tempo and beats of four songs for seamless mixing. Allows you to add a unique spin to tracks with sound effects. You can get as creative as you can by chaining multiple effects together and twisting all their knobs. DJ Controller Support. Has built-in mappings for DJ controller hardware that gives you hands-on control of Mixxx’s features. You can use the programmable mapping system to customize workflow and add support for any MIDI or HID device. Vinyl Record Control. You can use turntables with timecode vinyl records to control playback and scratch your digital music file. Record and Broadcast. Mixxx is packed with a number of recording and broadcasting features to help you share your mixes and spread your name. Here are some of it. Sophisticated music library. Mixxx’s music library is designed to help you organize your music well, so you can sort and search it conveniently and quickly. It is packed with a high-performance database for intuitive and fast searching. For those who love to mix music, have a dream of becoming a DJ or are already DJing, the list of DJ software above is for you. 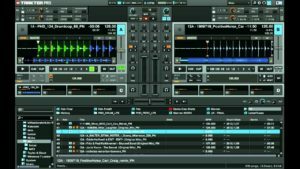 You can start your DJing career using these software applications or indulge in your passion for music no matter what your favorite genre is. If you are looking for the best DJ software, try the brands mentioned above and you will surely love it. Some are free and others are affordable because we make sure that you will find one that fits your budget. So, try any of it today. What Is DJ CLUB PRO?